As the S&P continues higher, we’re in the process of building a stable of downside opportunities. This list will change over time as (or if) the S&P reaches its forecast. For now, we’ll look briefly at MNST. The weekly chart shows what is likely distribution. Volume increasing on the way higher and then price action stalls. 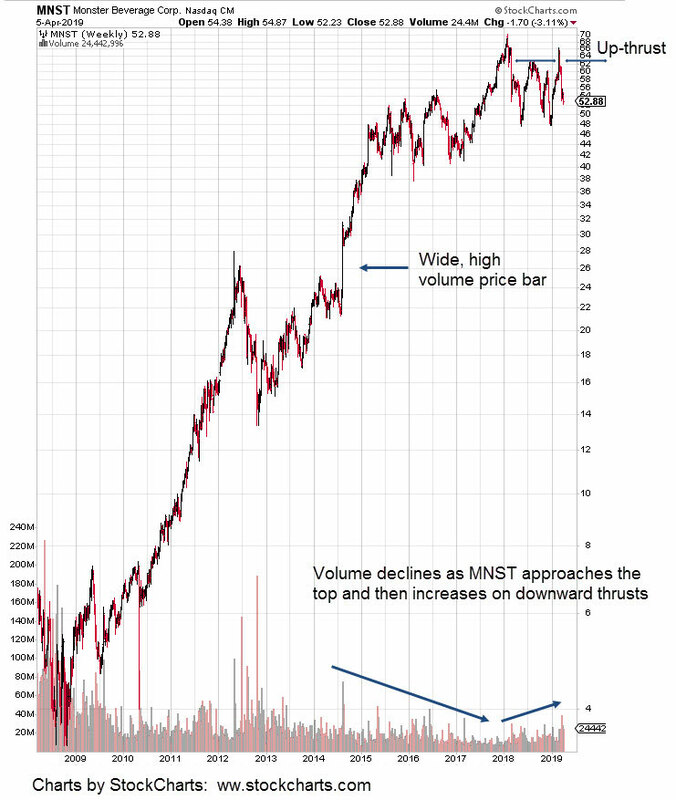 As MNST moves sideways (with downward thrusts) volume begins to increase. At present, MNST has up-thrusted the 62 – 66 area and moved lower in what appears to be its first significant leg lower. The next earnings release date for MNST is scheduled for May 14th according to this link. If the up-thrust is in effect, that date is the most likely time for a test (and reversal). We’ll be waiting.